The all new complete and simple to use AAA Quality highly optimized Physically accurate PBS based Advanced Screen Space Ray-traced Reflection Solution for Unity 5 Pro & Personal. With support for NEW Off-Screen reflections, V3 comprises of two packages in one. V2.2 is also included which has been updated for performance/quality and complete VR SUPPORT. 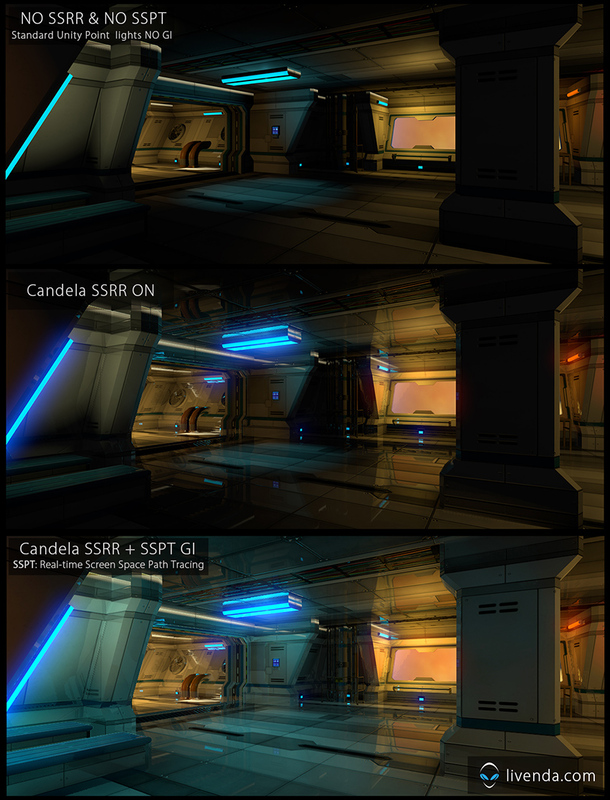 Candela SSRR is implemented as a Unity Image Effect which can be attached to a camera in your scene. Being a pure post effect solution means it has no dependency on scene complexity. • V3 is the first SSR solution providing reflections from Off-Screen object. This gives almost a complete total scene ray-tacing solution with full PBS support. 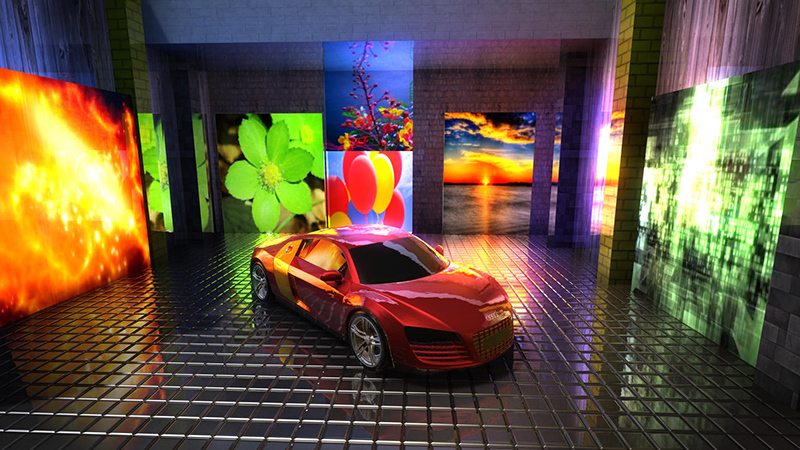 • V3 plus the included and updated V2.2 has much improved Contact based reflection blur. Reflection blur amount from PBS shaders can be adjusted based on distance and angle. • Significant reflection Quality increase. Eliminating silhouettes around occluded reflections. • Candela SSRR is now Physically correct and PBS ready in all respects. • Complete support for Unity 5 Professional & Personal. Which means it works with All Render Paths and All Shaders. Supporting almost all platforms, OpenGL, OpenGL ES3 DirectX 9, DirectX 11. 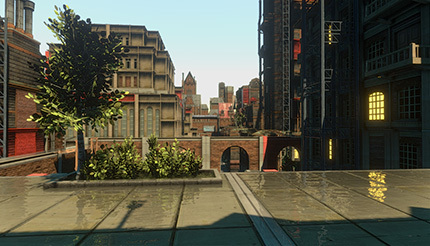 New Deferred Shading, Forward Rendering and Legacy Deferred Lighting. • New Physically correct Convolution - no more slow and incorrect Bilateral Blur. Very closely matching Unity 5 PBS / IBL and Reflection probe convolution for correct blending. Multiple performance options can be easily selected suitable for your project withing the Editor Inspector GUI. • SSR Shimmer Reduction & Highlight Compression! i.e. 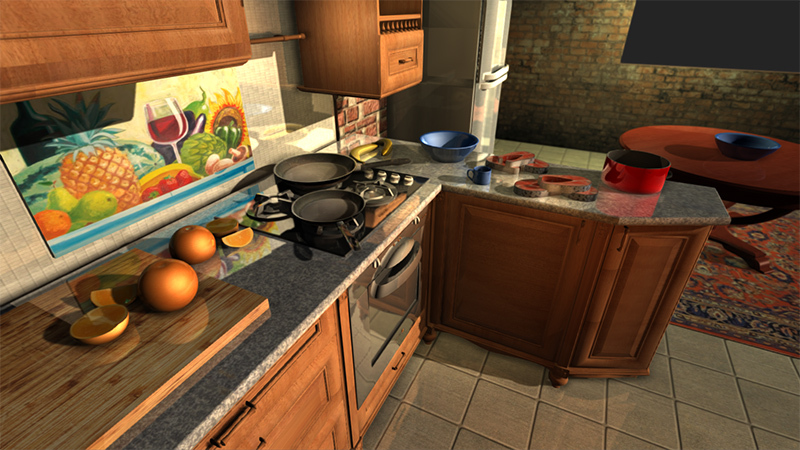 Physically Based shading (PBS) such as the one utilized by Unity 5 is susceptible to high frequency highlight shimmer primarily caused by very high specular values. Screen Space Reflections can intensify this as sub-pixel motion increases. Also as roughness becomes high (more blurry), these sub-pixel highlights will cause distracting low - mid frequency shimmer during convolution. Candela V3 reduces this significantly. Temporal shimmer induced by high-frequency normal-maps and other causes can be seen in all other SSR implementations to date. • PBS Metallic & Specular Color now effect SSR reflection Color! Occlusion Chanel can also be used when activated in the standard (or standard specular) shader. V3 is Deferred path only, the included V2.2 supports all render paths and is VR OPTIMIZED. • New & much improved Physically Based Compose blend mode - Candela SSRR V3 uses a new cleaner 'Masking' Texture to compose SSR on top of the scene making it much more Physically plausible than just ' additive blend ' with the visible scene. • Highly improved Ray Distance Traversal based reflection fall off. Fresnel fall off only is not adequate as far away (distant objects) reflections (such as the sky) etc. will not be covered unless a ray distance based fall off also modulates reflections. • Cleaner and leaner inspector UI which is much more intuitive with Performance & Quality target selections right at the top making it a breeze to use. • Highly customizable and Artist friendly ! You have total control. Some notable features include easy manipulation of pixel accurate reflectivity factor, surface roughness (Gloss / Blur), Physically based composition, HDR support and many other reflection control parameters on per material basis. Candela SSRR makes it very easy to add AAA Quality dynamic reflections which are tuned for accurate PBS paradigm for all your Unity projects, after all reflections are every where in the real world now you can also have them in your Unity Projects.